Sometimes nothing is more satisfying than a steaming bowl of chili. There’s something irresistible about that combination of meat, beans, and spices, simmering all day in a tangy gravy that beckons the taste buds. Whether you eat it straight, scoop it up with chips, or smother it over a hotdog or fries, it’s one dish you can serve that just about everyone enjoys. Since this week #SundaySupper is getting its skinny on, I thought it was time to break out my Skinny Beef Chili recipe. Now, anyone who’s been to a barbecue at my place knows to seek out the crockpot simmering with my adaptation of the Hard Rock Cafe’s chili. Loaded with ground beef, chunks of steak, diced jalapeno, and a myriad of seasonings, it’s been a sure hit every time. But, it’s also a lot of work and loaded with calories–not practical for everyday fare. For today’s recipe, we’re doing a complete 180. This heart healthy chili is low in fat and low in sodium, but there’s no short-changing on the flavor. As a bonus, the whole thing comes together in about 35 minutes, making it a no-brainer for a weeknight meal. Just serve it over a bed a greens, top it with a little shredded low-fat cheese, and you’re good to go. The leftovers are great packed up for lunch the next day, and it also freezes well for future quick meals. Heat the broth in a large skillet over medium heat. Add the chopped onion, bell pepper and garlic. SautÃ© this until the veggies soften.Â Sauteing in broth instead of fat helps cut some calories without sacrificing flavor.Â Add in the ground beef, breaking it up as it browns. 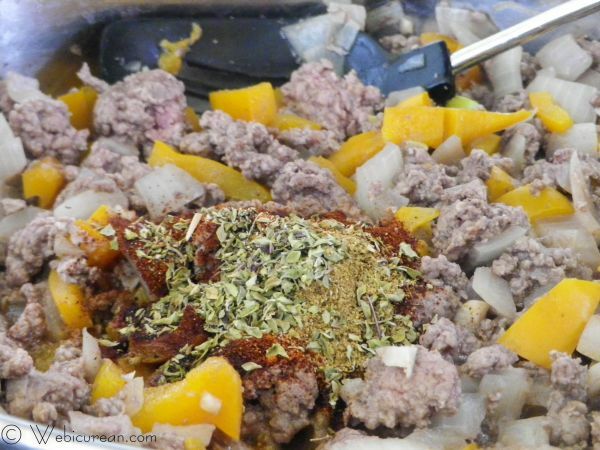 Once the ground beef is cooked, stir in the seasonings. Next, stir in the beans and tomatoes, bring to a boil, then cover and simmer about 20 minutes. Note, this dish is intended to be low sodium, however, if you’re not accustomed to low sodium foods, you may want to add just a bit of salt until your taste buds adjust. Serve it piping hot with a little low-fat cheese as a garnish. I love mine served over a bed of greens! Now, let’s see what other skinny dishes the #SundaySupper folks have cooked up below! Spicy and packed with flavor, this heart healthy skinny beef chili is sure to keep you warm. 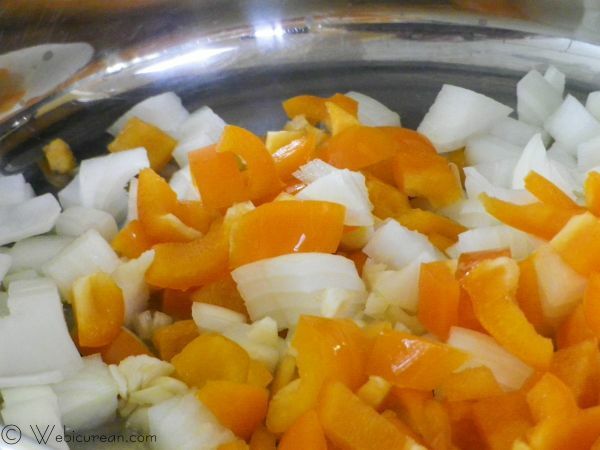 Heat the broth in a large skillet, then add the onion, bell pepper and garlic. Saute until the veggies soften, then add the ground beef, breaking apart until cooked through. Stir in the seasonings and the beans, then add the tomatoes. Bring to a boil, reduce heat, cover and simmer about 20 minutes. Sugar Free Banana Almond Muffins byÂ What Smells So Good? Join theÂ #SundaySupperÂ conversation on twitter each Sunday.Â We tweet throughout the day and share recipes from all over the world. This week we will be sharing out special skinnified recipes! Our weekly chat starts at 7:00 pm ET and you do not want to miss out on the fun. 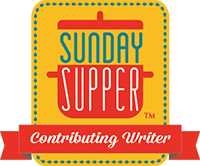 Follow the#SundaySupperÂ hash tag and remember to include it in your tweets to join in the chat. Check out ourÂ #SundaySupper Pinterest boardÂ for more fabulous recipes and food photos. I like to make Chili Salad too! What a great idea for Chili! Looking forward to trying it. 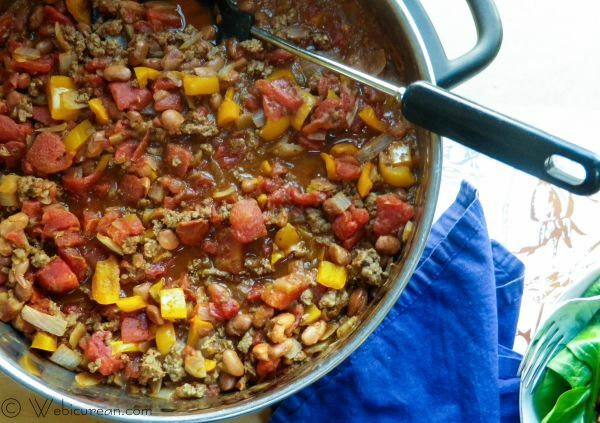 I firmly believe everyone needs a skinnier version of chili – it’s not all that on it’s own. Yours looks extremely delicious and perfect! 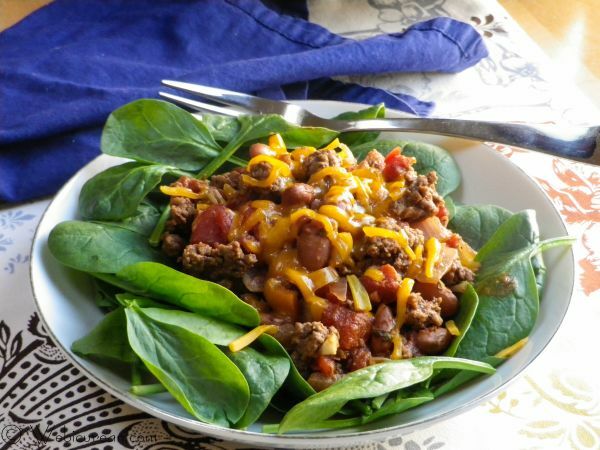 I really like the idea of serving the chili on a bed of greens! Sounds delish. Love the idea of sauteing in broth! This looks fantastic. Thanks for sharing! 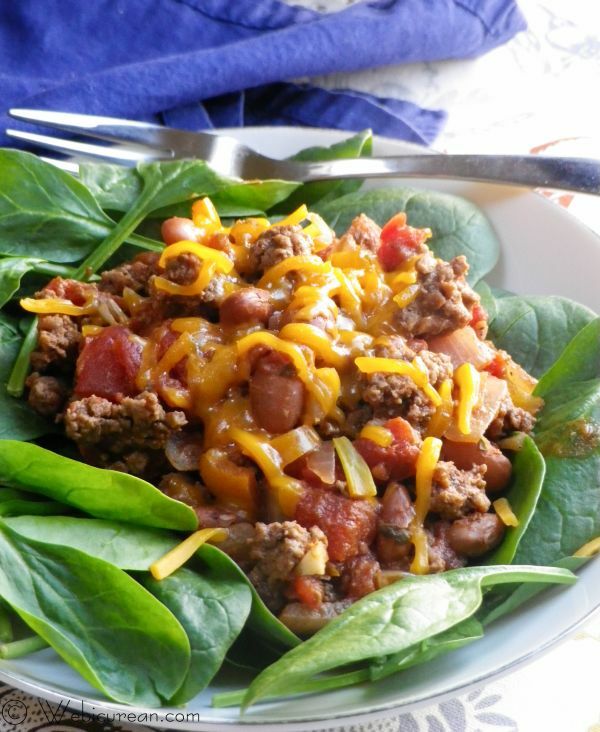 Skinny chili served on spinach leaves? LOVE the idea! It sounds so spicy and flavorful! A great twist on the common chili. Delicious!!! I love your presentation on a bed of spinach. It sounds and looks fantastic! Most colorful chili I’ve ever seen. Makes me want to eat it right out of the screen. Beautiful picture! I love that you served it in a lettuce leaf. This is beautiful! Clearly the answer to pretty chili is skinnyfying it! Chili is one of my all time favorite hearty and comforting meals. So perfect for a cold evening! Love how you skinnied it up!! My husband used to love a good pot of chili, I best it’s one of the things he misses the most as a vegan! 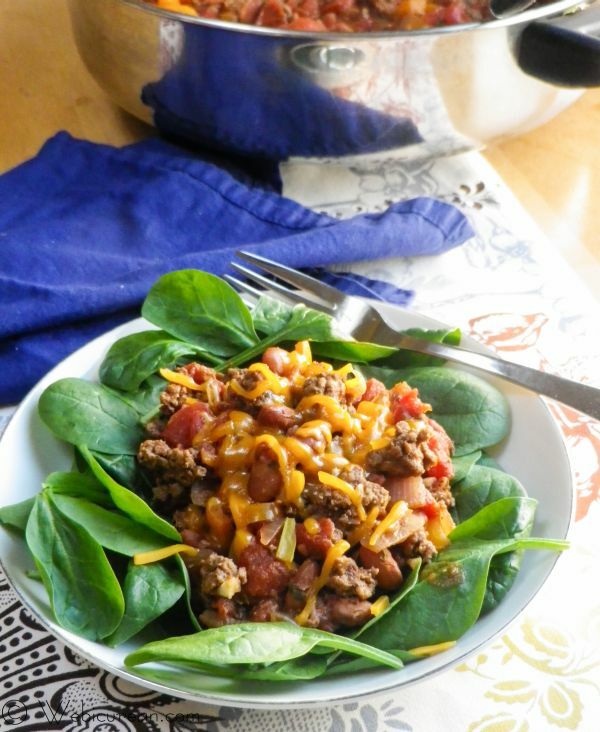 What a great idea to serve the chili over a bed of greens! Love this!! Alice @ Hip Foodie Mom recently posted..Soba Noodles with Edamame and Green Onions for a Healthy #SundaySupper! Yum…I hate it when chili is so greasy that it’s like a slick on top. You did a great job of solving that problem…so yummy! These are gorgeous photos, Anna! My mouth actually dropped open at the sight of your opening shot of the chili. Wowsers! I love that you skinnified it and served it on a bed of greens. This would be an amazing meal, I can’t wait to try it. YUM! I love making chili and it is so satisfying when you know it is healthy for you. This is perfect! 35 minutes prep & cooking time sounds good to me! You jsut reminded me to make chili again, it has been a while… Thanks for sharing! LOVE how you lightened this up! This is so my kinda meal!! 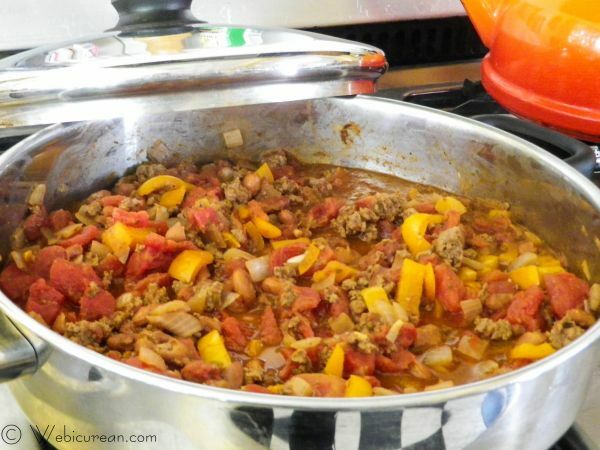 Mmmm…love chili and with your quick and healthy version…well now we’re talking! Love the idea of serving on a bed of spinach too! I love this chili! I’ve made very similar using ground turkey. Your chili is bursting with wonderful flavour!!! Wow, what a magnificent chili recipe! All the flavor with less fat…wonderful tweaks!!! That’s a trick a learned a few years ago too! I love sauteeing in stock when I want to cut out the fat. Your skinny beef chili looks so hearty and delicous! Oh yum, this looks so hearty and delicious. You will never know it is better for you, great idea to serve it over a salad! I want to come to a barbecue at your house and look for the crock pot of chili! This looks delicious, Anne! I love this recipe. I’ve been playing around with variations (using fresh cherry or cocktail tomatoes instead of canned, replacing the stock with beer, adding some balsamic vinegar, including mushrooms) and it turns out every time. Seriously yum. And because I’m a single student, one batch will last me a whole week! Thanks and YUM! I think I’m going to try some of those variations! Skinny Salad Wraps for a Healthier #SundaySupper | Mama.Mommy.Mom. Healthy Fettuccine Alfredo with Greek Yogurt.